In the March issue of Consulting Magazine, 35 consultants under the age of 35 were selected as "Rising Stars of the Profession." 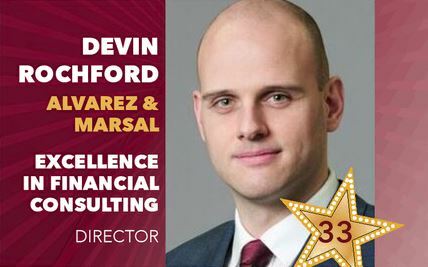 Alvarez & Marsal (A&M) Director Devin Rochford was chosen for his Excellence in Financial Consulting. Mr. Rochford joined A&M to lead the build out of the firm's business modeling and analytics service offering. Since joining, he has been instrumental to securing key modeling and analytics wins in multiple geographies, has led the marketing rollout of the modeling and analytics offering, has co-led the development of a machine learning-based debt rating model and led a redesign of the tools and processes associated with how the firm values private loans. Congratulations to Mr. Rochford and the other professionals selected. To read more on Devin Rochford and to access the full list, click here.